Vigorous, variable scrambling shrub with long biennial, woody stems densely covered with sharp thorns. May form dense thickets. 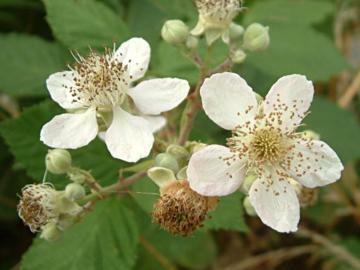 Palmate or ternate leaves and clusters of white or pink-flushed flowers in summer followed by edible, fleshy black fruit. Almost any soil in sun or shade. Thrives best in reasonably moist soil that not too alkaline. Drought tolerant once established and will survive in very exposed situations. Cut out old canes after fruiting. By seed or from the readily produced suckers. Probably the best known edible "hedgerow" fruit. Named varieties are cultivated. 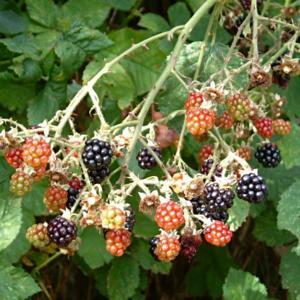 Fruits, leaves and roots are used medicinally, particularly for the treatment of dysentery and diarrhoea. Very common wild fruit. They are also a number of cultivated varieties.